It may surprise you to learn that the room in your home, where you go to relax, can be the most deadly, when it comes to accidents. This room is the bathroom. This is never more true for seniors, who may be facing decreasing mobility, and coupled along with the hazards of water, electricity and slick tile, can make a trip to the bathroom, even life threatening. The good news is that there are steps you can take, to make the bathroom in home of your elderly loved one, much safer. This way when they go into the bathroom, they do not need to worry, about the possibility of falling, or suffering some other kind of accident. Here is what you need to know about how to make the bathroom safer for seniors. Not only do seniors suffer from decreased mobility, it is often coupled with poor balance. This can make the bathroom hazardous when it comes to falls. One of the first measures to put into place can be a grab bar, or handle. 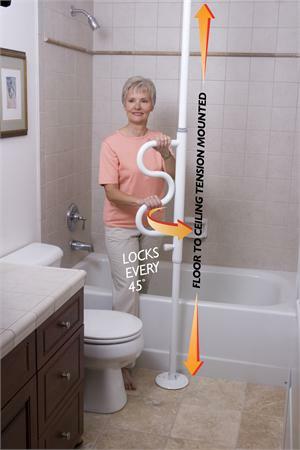 These bars can be put into place, on walls, cabinets, or the sides of the bathtub, where the senior can grab onto them for extra security, and help balancing. If the senior is mobile enough to step in, and out of the shower, a grab bar, can help provide extra balance and stability, when getting into, or out of the shower. One of the easiest fixes for the bathroom, is putting in a raised toilet seat. Many times seniors, who have limited mobility, find it difficult to lower and raise themselves on a regular toilet seat. This can lead to a loss of balance that can result in a devastating fall. These toilet seats can be locked onto the regular toilet seat, to prevent shifting, during use. Many of the models come with arms attached, that also aid the senior when lowering, or rising from the seat. There are many styles of these raised toilet seats, that are available. Some can be fixed permanently, (if the senior is still living in their own home or has their own bathroom), while others can be temporarily fixed to the toilet seat, and then removed, if other people will be using the toilet. While the flow of water, and electricity, throughout the bathroom, may not mean much to most people, for seniors this can be deadly. Water is often the culprit when it comes to falls. Take a look at the shower, where many falls happen, and determine if there are steps you can take to make it safer. A shower bench can provide a comfortable place, for your elderly loved one, to bathe from. 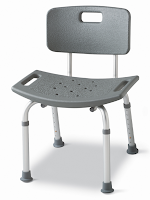 In addition, if your senior needs assistance, using a shower bench, can be beneficial for the caregiver as well. Sometimes the smallest items, can potentially be the biggest problems. Loose rugs can cause tripping, cords strung across the floor, or counter, or even harsh cleaning chemicals, all present obstacles for the elderly. Simply taking the time to examine, what could be a problem, and then putting a solution in place, can make the bathroom a safer, and more enjoyable experience for your elderly loved one. You're very right about these dangers, and so many of us are unaware of them. I was reading the St Andrew's Resources for Seniors System blog and there are so many hazards just at home that we don't necessarily think of. T.Gibbs - follow this link to order the tension rod. There is also a helpful video.